Hundreds of raucous protesters, including striking Verizon employees, converged on a McDonald's restaurant in Times Square Thursday demanding a $15-an-hour minimum wage for fast food workers. "What do we want? 15! If we don't get it? Shut it down!" chanted the protesters at dawn, bathed in neon light from the restaurant and Times Square billboards. The crowd of about 300 protesters included a marching band and dancers. A pair of protesters dressed like the Hamburglar carried an outsized effigy of Ronald McDonald outside the restaurant as several McDonald's (MCD) customers sipped coffee and watched. The protesters were demanding a minimum wage of $15 per hour for fast food workers around the country. New York lawmakers approved a plan on April 1 that will gradually raise the minimum wage to $15, from the current minimum of $9. The minimum wage could reach $15 in New York City by 2018, but statewide it will take longer. At Thursday's protest many of the demonstrators, including McDonald's employee Jumal Tarbir, wore black sweat shirts with slogans like "Black Lives Matter, Fight for $15, Immigrant Justice" and "I Can't Breathe," a reference to Eric Garner, a black man who was killed in a choke hold by a white police officer on Staten Island in 2014. "It just shows you this isn't just for fast food workers," said Tarbir. "This is about everybody all over the city. I think for people to survive, $15 [an hour] is a good start. I think that living in New York City you can't survive off $8.75. You can't survive off $10." 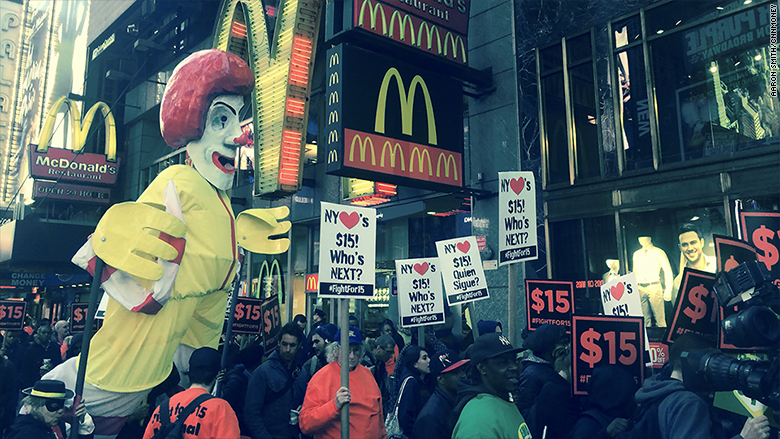 Protesters for a $15 minimum wage converged on a McDonald's in Times Square bearing an effigy of Ronald McDonald. McDonald's customer Catherine Ayala, who works the front desk at a nearby hotel, agreed with him. "I think they should get $15, absolutely," said Ayala, who ate her breakfast in the restaurant over the sound of chants outside the window. She said she would be willing to pay more for her food to help them achieve $15 pay. "If we don't raise their minimum wage, somehow the taxpayer will have to pay for it," she said. "So we'll pay for it by paying for the product instead." 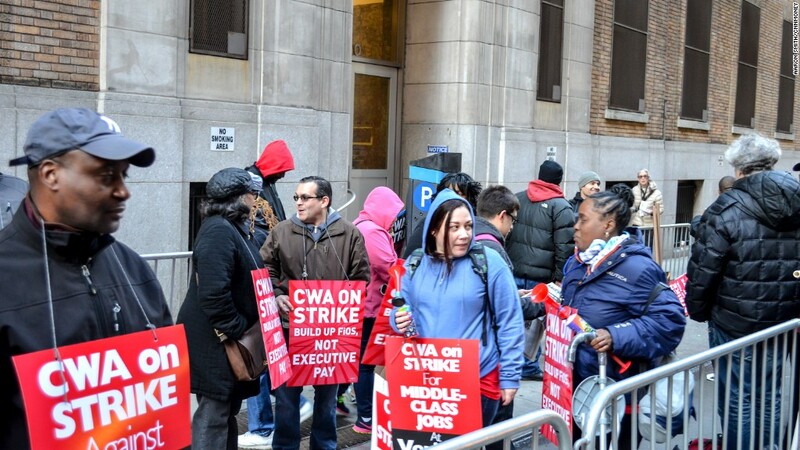 Verizon (VZ) workers Tom Parisi and Jim Del Priore, who were both on strike along with 36,000 Verizon employees, were marching with the fast food workers to show "solidarity" for their cause. "We're supporting them and they're supporting us," said Del Priore. "We'll all in the same fight. Good jobs, good pay. Honest jobs, honest pay. That's all anybody wants. Nobody's getting greedy here. People just want to take care of their families." McDonald's announced last year that it was raising its minimum wage at company-owned (non-franchise) restaurants to $1 more than the "locally-mandated" minimum wage.